Curtis Pitts began the design of a single-seat aerobatic biplane in 1943-44. The design has been refined continuously since the prototype’s first flight in September 1944; however, the current Pitts S2 still remains quite close to the original concept in design. All single-seat (S-1) and two seats (S-2) Pitts Specials are variations of the basic design. Pitts produced limited numbers of aircraft during the 1940’s and 1950’s. The Pitts Special became the standard by which all other aerobatic aircraft were judged. 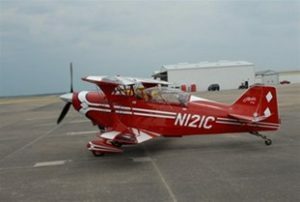 While many homebuilt aircraft were built in the 1960’s, Pitts worked on the design of a two-seat aerobatic trainer version, the S-2, which first flew in 1967. Factory-built aircraft produced by the Aerotek Company in Afton, Wyoming were joined in production by the single-seat S-1S in 1973. 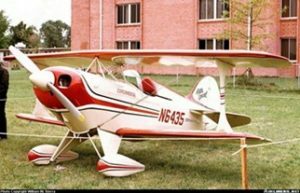 The design’s popularity grew significantly following Bob Herendeen’s participation on the USA Aerobatic Team in a Pitts Special in the World Aerobatic Competition in Moscow, Russia in 1966. In 1972, the US Aerobatic Team won the World Championships flying only in Pitts biplanes. In 1977 Curtis Pitts sold his interests in the Pitts S1 and S2 to Doyle Child. Mister Child later sold the rights in 1981 to Frank Christensen, who continued production at the Afton plant under the name of Christen Industries. The rights for homebuilt versions of the Pitts were sold in 1994 to Steen Aero Lab, with the Afton factory and production rights being transferred to Aviat. Curtis Pitts died in 2005 at age 89. At the time of his death, he was working with Steen on the prototype of the new Pitts Model 14; a brand new, two-seat biplane designed for unlimited aerobatics powered by the 400 horsepower Vedeneyev M14P radial engine. Is that Airplane Wearing Pants? The Pitts Special, unlike most of the other aircraft in the museum, places a high emphasis on speed being an aerobatic airplane. 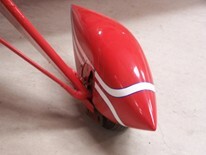 To squeeze all of the performance out of the design as it can, the wheels on the main landing gear are covered with streamlined fairings which in this country are commonly referred to as “wheel pants.” In England, these same items are called “spats.” Wheel pants, by eliminating the air turbulence around the tire and wheel assembly, reduce what is called “parasite drag” on the airplane. Parasite drag is that resistance to moving through the atmosphere that is caused by the parts of the airplane that do not contribute to the lift of the airplane. The wing itself on airplanes generates drag, but that drag is known as “induced drag” or drag resulting from the parts of the airplane that create lift. By installing pants on an aircraft it is possible to increase the speed of the airplane by about three to five miles per hour while using the same amount of engine power. That means that when pants are installed an airplane can fly a greater distance on the same amount of fuel, therefore, wheel pants save on fuel costs to operate an airplane! The photo above illustrates the difference in the wheel/tire profile when wheel pants are not used. 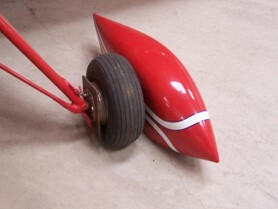 Of course, there are some disadvantages to using wheel pants. They cost more initially due to extra time installing and the material cost if operated from airports that do not have paved runways and taxiways they can collect mud, snow, and ice with the rare possibility of the wheel freezing in place at altitude which can result in landing with a locked wheel. In addition, while the pilot makes their pre-flight inspection it is more difficult to examine the condition of the tires as a major part of the tire is hidden in the enclosure. Some pilots will roll their aircraft on its wheels during pre-flight in order to inspect the entire tire. Lastly, novice pilots sometimes use the streamlined fairings as a stepping point which can cause damage to the units! 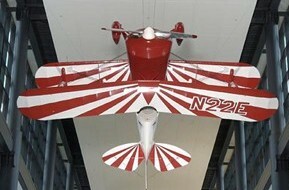 The oldest surviving Pitts Special, Little Stinker, was the second aircraft constructed by Curtis Pitts. It was the smallest aerobatic airplane in the world at that time. Betty Skelton bought this airplane in 1948 for $3,000, and with it she won the 1949 and 1950 International Feminine Aerobatic Championships. Her impressive flying skill and public relations ability heightened awareness of both aerobatics and the Pitts design. Skelton made several changes to her Pitts Special including having her father construct a small Plexiglas canopy for cross-country flight that was easily removed for aerobatics. She replaced the original Aeromatic propeller with a fixed pitch McCauley. 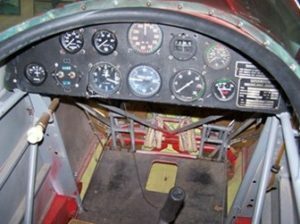 She also mounted a ball-bank indicator upside down in the instrument panel, for control coordination in inverted flight, just above the one used for normal flight. Skelton flew aerobatics in Little Stinker at the Cleveland Air Races and was a staple at air shows throughout the southeastern United States where she often doubled as the peach or magnolia queen. Skelton also wrote articles for aviation magazines and even had her own radio show. In the Pitts, she became the first woman to perform an inverted ribbon cut. She became known as the “fastest woman on Earth.” Ms. Skelton made her first solo flight – illegally- at age 12. She gave her first aerobatics performance when she was 19 performing with the Blue Angels as they made their debut in 1946. Betty was born in 1926, in Pensacola, Florida, and grew up watching airplanes flying above a nearby naval air station. As a girl, she played with airplanes instead of dolls. She ended up being named to no fewer than 11 halls of fame for her life pursuits. She died of cancer in 2011 at the age of 85. Her airplane, the Little Stinker, is on display in the entrance hall to the Steven Udvar Center suspended from the ceiling.